In this article, the basics of a relay like energized relay and de-energized relay are explained in detail. Also, the design, construction, working, applications, and also relay selection is explained in detail. We know that most of the high end industrial application devices have relays for their effective working. Relays are simple switches which are operated both electrically and mechanically. Relays consist of an electromagnet and also a set of contacts. The switching mechanism is carried out with the help of the electromagnet. There are also other operating principles for its working. But they differ according to their applications. Most of the devices have the application of relays. Why is a relay used? The main operation of a relay comes in places where only a low-power signal can be used to control a circuit. It is also used in places where only one signal can be used to control a lot of circuits. The application of relays started during the invention of telephones. They played an important role in switching calls in telephone exchanges. They were also used in long distance telegraphy. They were used to switch the signal coming from one source to another destination. After the invention of computers they were also used to perform Boolean and other logical operations. The high end applications of relays require high power to be driven by electric motors and so on. Such relays are called contactors. The figures given below show the actual design of a simple relay. It is an electro-magnetic relay with a wire coil, surrounded by an iron core. A path of very low reluctance for the magnetic flux is provided for the movable armature and also the switch point contacts. Â The movable armature is connected to the yoke which is mechanically connected to the switch point contacts. These parts are safely held with the help of a spring. The spring is used so as to produce an air gap in the circuit when the relay becomes de-energized. The relay function can be better understood by explaining the following diagram given below. The diagram shows an inner section diagram of a relay. 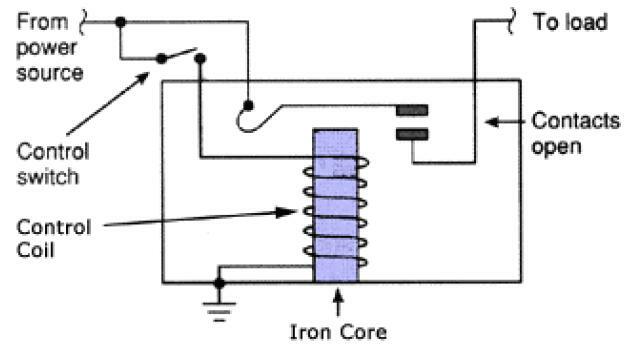 An iron core is surrounded by a control coil. As shown, the power source is given to the electromagnet through a control switch and through contacts to the load. When current starts flowing through the control coil, the electromagnet starts energizing and thus intensifies the magnetic field. Thus the upper contact arm starts to be attracted to the lower fixed arm and thus closes the contacts causing a short circuit for the power to the load. On the other hand, if the relay was already de-energized when the contacts were closed, then the contact move oppositely and make an open circuit. As soon as the coil current is off, the movable armature will be returned by a force back to its initial position. This force will be almost equal to half the strength of the magnetic force. This force is mainly provided by two factors. They are the spring and also gravity. Relays are mainly made for two basic operations. One is low voltage application and the other is high voltage. For low voltage applications, more preference will be given to reduce the noise of the whole circuit. For high voltage applications, they are mainly designed to reduce a phenomenon called arcing. The basics for all the relays are the same. Take a look at a 4 â€“ pin relay shown below. There are two colours shown. 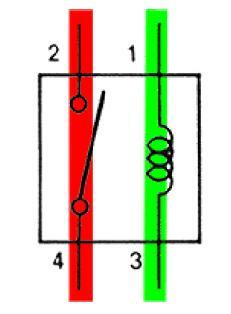 The green colour represents the control circuit and the red colour represents the load circuit. A small control coil is connected onto the control circuit. A switch is connected to the load. This switch is controlled by the coil in the control circuit. Now let us take the different steps that occour in a relay. 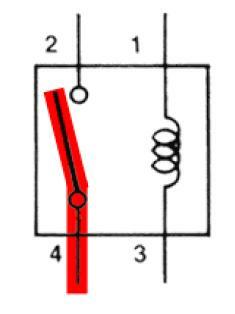 As shown in the circuit, the current flowing through the coils represented by pins 1 and 3 causes a magnetic field to be aroused. This magnetic field causes the closing of the pins 2 and 4. Thus the switch plays an important role in the relay working. As it is a part of the load circuit, it is used to control an electrical circuit that is connected to it. Thus, when the electrical relay in energized the current flow will be through the pins 2 and 4. As soon as the current flow stops through pins 1 and 3, the relay switch opens and thus the open circuit prevents the current flow through pins 2 and 4. Thus the relay becomes de-energized and thus in off position. In simple, when a voltage is applied to pin 1, the electromagnet activates, causing a magnetic field to be developed, which goes on to close the pins 2 and 4 causing a closed circuit. When there is no voltage on pin 1, there will be no electromagnetic force and thus no magnetic field. Thus the switches remain open. Normally Open Contact (NO) â€“ NO contact is also called a make contact. It closes the circuit when the relay is activated. It disconnects the circuit when the relay is inactive. Normally Closed Contact (NC) â€“ NC contact is also known as break contact. This is opposite to the NO contact. When the relay is activated, the circuit disconnects. When the relay is deactivated, the circuit connects. Change-over (CO) / Double-throw (DT) Contacts â€“ This type of contacts are used to control two types of circuits. They are used to control a NO contact and also a NC contact with a common terminal. According to their type they are called by the names break before make and make before break contacts. Relays can be used to control several circuits by just one signal. 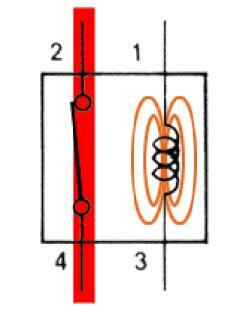 A relay switches one or more poles, each of whose contacts can be thrown by energizing the coil. Single Pole Single Throw (SPST) â€“ The SPST relay has a total of four terminals. Out of these two terminals can be connected or disconnected. The other two terminals are needed for the coil to be connected. Single Pole Double Throw (SPDT) â€“ The SPDT relay has a total of five terminals. Out of these two are the coil terminals. A common terminal is also included which connects to either of two others. Double Pole Single Throw (DPST) â€“ The DPST relay has a total of six terminals. These terminals are further divided into two pairs. Thus they can act as two SPSTâ€™s which are actuated by a single coil. Out of the six terminals two of them are coil terminals. Double Pole Double Throw (DPDT) â€“ The DPDT relay is the biggest of all. It has mainly eight relay terminals. Out of these two rows are designed to be change over terminals. They are designed to act as two SPDT relays which are actuated by a single coil. A relay circuit is used to realize logic functions. They play a very important role in providing safety critical logic. Relays are used to provide time delay functions. They are used to time the delay open and delay close of contacts. Relays are used to control high voltage circuits with the help of low voltage signals. Similarly they are used to control high current circuits with the help of low current signals. They are also used as protective relays. By this function all the faults during transmission and reception can be detected and isolated. Overload relay is an electro-mechanical device that is used to safeguard motors from overloads and power failures. Overload relays are installed in motors to safeguard against sudden current spikes that may damage the motor. An overload relay switch works in characteristics with current over time and is different from circuit breakers and fuses, where a sudden trip is made to turn off the motor. The most widely used overload relay is the thermal overload relay where a bimetallic strip is used to turn off the motor. This strip is set to make contact with a contactor by bending itself with rising temperatures due to excess current flow. 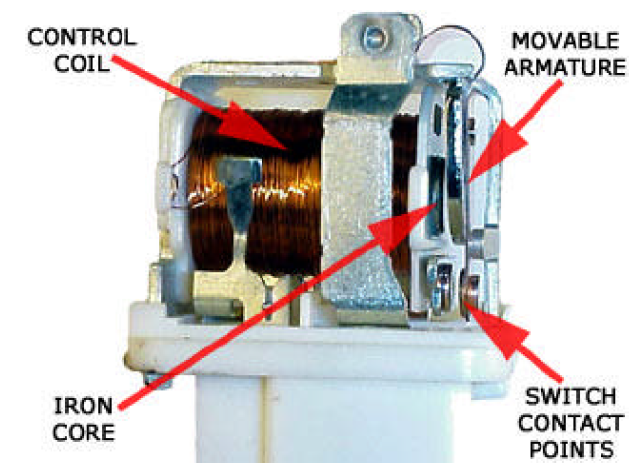 The contact between the strip and the contactor causes the contactor to de-energize and restricts the power to the motor, and thus turns it off. Another type of overload motor is the electronic type which continuously watches the motor current, whereas the thermal overload relay shuts off the motor depending on the rise of temperature/heat of the strip. All overload relays available to buy comes in different specifications, the most important of them being the current ranges and response time. Most of them are designed to automatically reset to work after the motor is turned back on. Protection â€“ Different protections like contact protection and coil protection must be noted. Contact protection helps in reducing arcing in circuits using inductors. Â Coil protection helps in reducing surge voltage produced during switching. Look for a standard relay with all regulatory approvals. Switching time â€“ Ask for high speed switching relays if you want one. Ratings â€“ There are current as well as voltage ratings. The current ratings vary from a few amperes to about 3000 amperes. Â In case of voltage ratings, they vary from 300 Volt AC to 600 Volt AC. There are also high voltage relays of about 15,000 Volts. Type of contact used â€“ Whether it is a NC or NO or closed contact. Select Make before Break or Break before Make contacts wisely. IR to RF converter circuit. It's Time to Welcome Gigapixel Cameras!! Relays respond to one or more electrical quantities like voltage or current such that they open or close the contacts or circuits. A relay is a switching device as it works to isolate or change the state of an electric circuit from one state to another.we also provide system protection services. Hi John! I am a retired Civil Engr, brushing up my knowledge of electronics for some fun projects for my home. I am impressed by the virtues of relays, and finding so many applications for them. But I need to fully learn how to use the 8 terminals on DPDT relays. So thank you for your fine post which is very helpful! I have liked the work because explains everything about relay. what would cause a relay to buzzz? Verry good I like this,..,. how can i use a relay for protection in case of a faut inside the circuit? very informative and explanations made very easy to understand. plz to be explian AUTORECLOSED TIME HOW TO OPERATEDED relay? Thank you soo much for these explenation..this is very helpfull to me..
Really useful Definitions should be given. not appropriate info. is given it has to be elaborated with design diagram………..
Its very helpfull for training.What, Why & How is Very good explained. how to know the transistor is working or not?